All 1968, 1969, and 1970 Mustangs were built with the engine in the front of the car and the drive wheels at the rear. A tubular steel driveshaft was used to connect the output shaft of the transmission to the pinion at the front of the rear axle assembly. I could use a nice picture of an original driveshaft for this spot. Please let me know if you have a nice, uncluttered shot with no extra additions to the image. Here's a table of driveshaft information that I've been able to find. Note that 1968 and 1969 Mustangs equipped with a 390 and a C6 automatic transmission shared the same driveshaft with 428-C6 Mustangs. The length of the driveshaft is measured from the center of the front u-joint holes to the center of the rear u-joint holes. The width is measured across the diameter at the middle of the tube. Stripe information is taken from original broadcast (build) sheets. I've heard rumors of other stripe combinations being used depending on the assembly plant, but what's here is all that I've been able to confirm to date. I should note that I've received information describing different stripe colors for driveshafts used on 1968 Shelby Mustangs. Peter Disher has told me that he has seen Shelby build sheets that identify the driveshaft stripe colors as LBLU DBLU RED for an automatic transmission and AZUR ORG YEL for a 4-speed manual transmission. Neither of us knows why there's a difference, but the fact that different manufacturing plants are involved might be a clue. I've also received a report of a driveshaft used on a 1969 Mustang equipped with an automatic transmission with what looks like red, blue, and a third tan, pink, or white stripe. There's also a thin red stripe just beyond the rear-most stripe. 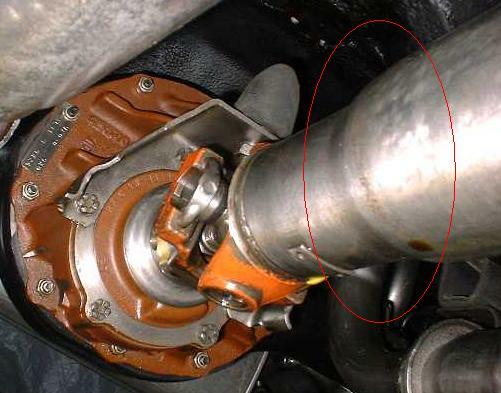 Here's a picture (thanks to Paul Cavaghan) - has anyone else seen a driveshaft like this used with a CJ or SCJ engine? Note that the shafts used behind CJ and SCJ Mustangs use different stripe patterns. I don't know why that is because the shafts appear to be identical, and they were serviced using the same part number. Engineering numbers are often found stenciled on the shaft. 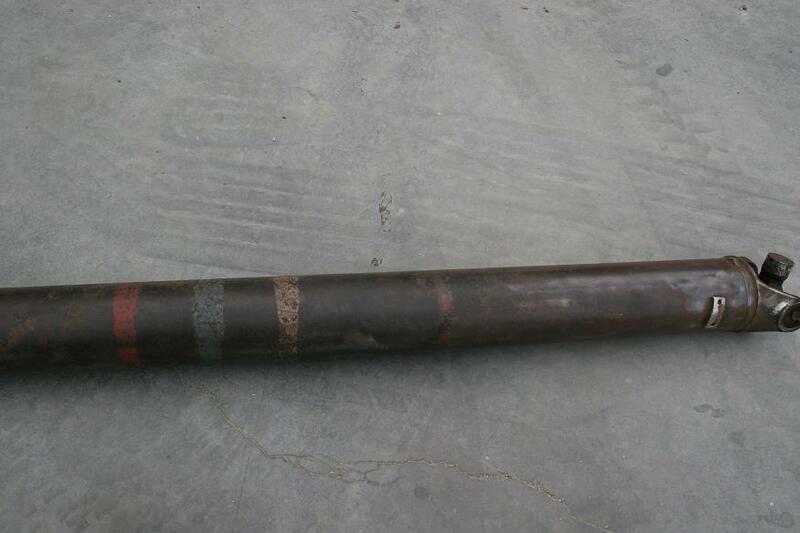 Gentle cleaning of a rusty shaft will often reveal many of these old identifying marks. Others, though, have told me that they've found a 3", untapered driveshaft on their cars. What's clear from the existing 1975-era documentation is that the 3.5" tapered shaft was the "correct" replacement on C6-equipped CJ Mustangs. That same documentation doesn't list a 3" shaft that's 46 19/32" long for any application. However, my OSI (Obsolete, Supersede, Interchange) manual describes a driveshaft with service part number C7ZZ-4602-D that was replaced by the tapered C8ZZ-4602-C driveshaft. Peter Disher has confirmed that the 1968 MPC describes the C7ZZ-4602-D driveshaft as having a 3" diameter and being the correct service part for both 390 and 428 CJ Mustangs. Another potential clue: a cross reference manual that I have from April 1970 associates the C7ZZ-D shaft with one of two engineering numbers: C7ZW-4602-D or C8ZW-4602-H. These numbers were often stenciled on the shaft. If you've seen one of the 3" driveshafts, did you notice any identifying numbers? If so, did they match one of the two listed in the cross reference manual? The color codes described above are translated in the table below. Common modeling paints found in your local hobby shop are a pretty good match for the original colors. I believe the 1968 BLU is supposed to be the same dark blue used in 1969. Special thanks are owed to everyone that has shared a copy of their build sheets since all of the stripe information described here was taken from original build sheets. Note that the location of the stripes varies, but many that I've seen are placed around the center of the driveshaft or maybe slightly toward the front. These stripes were painted on by hand to help assembly line workers quickly identify the driveshaft, so they're not expected to have crisp, clean lines or to be perfectly straight. The stripes are about 3/4" wide, with approximately 2" between stripes. There's some very good info describing driveshaft detailing on the Boss 302 Registry web site. The same front and year u-joints were used from 1968-1970. 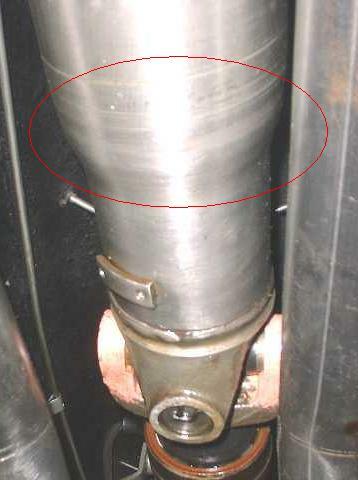 These joints were not originally equipped with a zerk fitting to add grease, but many common replacements include a zerk fitting. Joints without a grease fitting are supposed to be a bit stronger than joints with a fitting. The "1330" in the table below is an industry designation for the size of the joint. Aftermarket u-joints are readily available from many different vendors. The length of the slip yoke is measured from the front edge to the center of the u-joint holes. The width is measured across the u-joint holes from outer-edge to outer-edge.